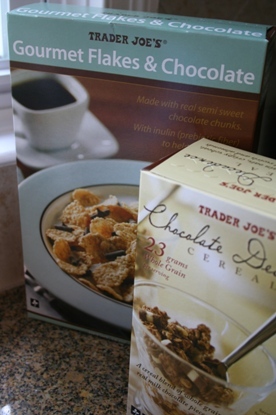 "New Cereals @ Trader Joe's"
These cereals caught my eye right away during my shopping at TJ's this week. I found out that they just came out this Tuesday. They both had chocolate in them, and I had to try them. First, I tried one flake by itself. It was not sweet at all, and I thought it would taste really good with slices of fresh bananas. Since I didn't have any bananas at home, I decided to sprinkle some of the granola with chocolate on it. It tasted pretty good together. I was surprised to find out that these were not as sweet as I expected. They will be nice additions to our daily cereal picks in the morning.